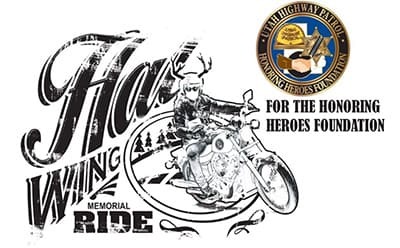 The 4th annual Hal Wing – Honoring Heroes Foundation Memorial Ride was a successful event! You can check out images of the ride on the Legends Motorcycle Facebook page. We will also be creating a video of this year’s event and we plan on posting that on our Facebook page as well. With the help of our sponsors we were able to make the Silent Auction and Raffle exciting and productive. As you know all proceeds of the event are donated to the Honoring Heroes Foundation, which provides financial assistance and academic scholarships for the families of Utah law enforcement officers. We would like to thank you and your company for the sponsorship provided to support the Hal Wing – Honoring Heroes Foundation ride. The ride could not be successful without the generous support of our caring community. Thank you all for your thoughtfulness, generosity, and continued support to the Honoring Heroes Foundation. The donated items not only help us produce a major portion of the proceeds, they also help us attract participants who might not otherwise attend the event. We greatly appreciate your generosity and cannot thank you enough. Next year’s ride will be held on July 15th 2017. We look forward to planning next year’s event to be bigger and better. We hope to have your company be a part of its success next year as well. Again, thank you for your donation and your support.